One of the most respected of all career options, Medicine is the study that deals with identifying, treating and preventing diseases. Bachelor of Medicine and Bachelor of Surgery, is an integrated four and a half years study programme that students have to pursue to become a doctor. It doesn’t need an explanation as to why the profession of a Doctor is one of the most respected and desired profession. Doctors carry out the most important job of ensuring that diseases are prevented or cured. Although a career in medicine may imply many other professions, the one of the Doctor is the most prominent of all. 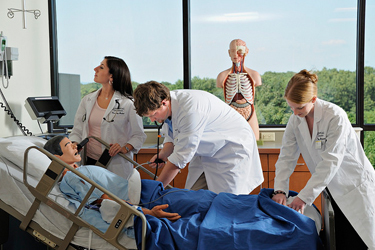 To become a Doctor, one has to complete MBBS or Bachelor of Medicine and Bachelor of Surgery. Although it may imply two degrees to a layman, it is in reality a single degree that educates an aspiring doctor in the intricacies of health problems and their cure. Students, who complete the MBBS course successfully, prefix the title Dr. to their names. Though the MBBS degree was considered qualification enough for practicing medicine, today, most doctors pursue a post-graduation course in medicine and healthcare to excel in their profession. A study by KPMG (a professional service company), shows that in India there are only 6 doctors for every 10,000 people. This is a remarkably low number and the country needs well educated and energetic healthcare professionals. If one has fondness for subjects like Biology, Physics and Chemistry, the medical field is an ideal career. Not only is medicine and surgery a lucrative career choice, it also brings along a position of reverence in the society. To become a doctor, one needs to first graduate with an M.B.B.S. (Bachelor of Medicine and Bachelor of Surgery) degree. Some countries, such as the United States and Canada, require medical students to complete their undergraduate before entering medical school, necessitating eight or more years of education. On the other hand, many other countries treat medical school as an undergraduate programme, and only require five or six years of schooling. Medical school programmes in Europe and Australia are pretty standardised: Medical students need to complete six years of undergraduate study, plus an internship, in order to become a doctor. The exception is Germany, which requires completion of a five-year programme. The Philippines also offers a "4+4" programme for becoming a doctor, and South Korea recently switched to a similar programme from a six-year undergraduate programme. In order to be eligible for the MBBS or BDS course, students should have passed their 10+2 exams with Physics, Chemistry, Biology/Biotechnology and English, individually with a minimum of 50% marks in Physics, Chemistry and Biology/Biotechnology taken together. MBBS is one course which requires a lot of patience. The In India, the course takes 5½ years to complete, comprising of 4½ years of classroom study followed by a year of a rotating internship). The 4½ years of class room study is divided into 4 phases. In each phase, there are semesters. At the end of each phase, a special exam is held. A phase is generally referred to as “professional” in MBBS jargon. The third professional is devoted to monthly clinical work in the wards and departments of the hospital. In all there are 3 professional examinations, followed by practical and clinical examinations. Your pay as a doctor depends on the organisation you work for, number of hours you can put in, your experience, skill, reputation, the geographic region, and similar factors. 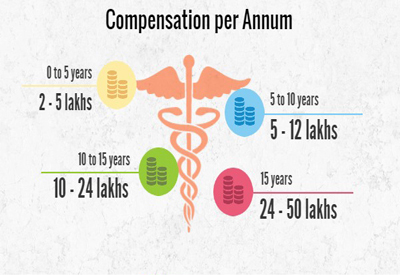 The total compensation for a doctor in government hospitals usually includes the salary, bonus, research stipends, bonuses, and other benefits. It is often seen that private practitioners and self-employed doctors have a higher median income. As you will notice in the following table, after a couple of years in this field, your salary increases in leaps and bounds. Apart from the general medicine, a new field has emerged in this real: Para-medicine. It is the intersection of healthcare, public health and public safety. The major areas of work in the field of paramedical sciences are spinal injury management, fracture management, obstetrics, management of burns and assessment, and evaluation of general incident scene. Physiotherapy, Occupational Therapy, Speech Therapy, Prosthetic & Orthotic Engineering and Nursing are some its well-known areas. A branch of medicine, dentistry basically deals with diagnoses, treatment and prevention of oral disorders and diseases. Although it is primarily related to teeth, it is important for the overall health of a person.